... I buy too much. This post is just what I bought locally in the past two month or so. I have made various online purchases and those are posted separately. Many of these purchases were tempted by great gift with purchases, or just an urge to moisturise, note the unhealthy number of tubes of hand creams. I feel embarrassed to post all of these out because many of these products are good but unnecessary. How long will it take to go through these silly pile? Warning: inappropriately picture heavy post. It is one of my new year resolutions to not buy too many, or any more. I am happy to report that, since the beginning of 2013, I have not bought any make up product. In my mind there's a plan, i.e. to limit myself to certain number of make up product only in the year of 2013. It will be another post when I figure out all the details. Basically, this also serves as a prologue to the project/competition that my friend Sam and I are going to kick off tomorrow, which will run in the month of February. If you have any questions on the products I showed, feel free to leave a comment below. What have you been guilty of buying lately? No.7 Beautiful Skin Hot Cloth Cleanser ($129, 200ml, 1 muslin cloth) $20 off total! Bioderma at Mannings was doing too good a deal to miss, so I stocked up. I had a $20 off coupon off No.7 line to use, so I got a back-up of my favourite cleanser and try a pack of new wipes. Wanted some new Revlon lip butters so badly so with the buy1get1, I picked up four. Their gift with purchase surprises are great as well. Been experimenting with hair more so I picked up some hair spray and dry shampoos, mainly for volume. Estee Lauder makes great skin care, others say, so I bought some minis to test out. Wanted a good black for doing Galaxy Nail Art (link to my post), so I went out and did some damage at Sasa. Hand Cream xhore am I. The MissCarol stuff is amazing; I bought extras to give to friends. More Hair Spray, continuing my hair styling self-taught programme. Bit my lips and purchased a tube of fragrance free eight hour cream, can't wait to try! Bought the perfume samples to try if they are good. Lady Million is delicious but mature, not old-mature, but a bit too much for me. Flowerbomb really lives up to its hype, yummy; the truth is true that it is literally the same as Zara's version (link to my post). Collection 2000 was doing buy2get1, and free lipgloss with purchase. Laura Mercier is a dream come true, I wish I can afford the full size ones! Daiso detergents are necessary repurchases. Went to Choifung per my sister's request. The two oils are for my sister - ingredient list below. Got some hand creams for myself. The third picture shows all the free samples. Some random samples obtained from various places. Firm Favourites is a new series featuring current favourites that I know for certain that I will continue to love, not just temporary. Number one and two have been posted, which is about a discontinued wonderful mascara, and a skin care line I cannot live without. I find myself amused by the fact that some of my favourite series on my blog are both FFs - FaceOfTheDay Fridays, Finished Fortnight, and now, the introduction of Firm Favourites. Interesting, isn't it? Shampoos maybe boring to some, but for frequent hair-washers like me, it is a necessity that I do spend quite a fortune on. For your info, I wash my hair every night in the shower. I have flat and fine straight East-Asian hair, little amount of it. I am a sucker for anything labelled volumising, revitalising, scalp-care or targeted towards hair-loss or hair-thinning. I am lazy at using conditioner or hair mask, only perhaps every other day, or less. Hence, I also demand my shampoo to leave my scalp light and fresh, while at the same time hair sleek and decently moisturised - greedy wishes I know, but I do think I have found some favourites! Sen 森 by Kim Robinson is new to me. I have recently discovered it in local Watson's. It is not cheap in terms of drugstore hair care. I paid $88 for the 400ml bottle, nearly double or triple the amount I would pay for other brands in the pharmacy. Initially I was drawn by the fact that it is bad-ingredients-free - no parabens, phthalates, synthetic colours or added petrolatum surfactants. The philosophy behind this brand is a balance or integration of Chinese herbal wisdom and Kim's experience with Asian hair. Kim is a celebrity hair stylist and has been in the field for decades. Onto the product. I have been using this for over a month now, and day-by-day growing to like it. Sleek and Silky helps hair to be straight and flowing. Straight is how my hair naturally grows, but flowing is something I desire. My hair tends to be too limp and thin that it either lies flat or goes frizzy. My experience with this shampoo is very positive. Many times I don't use a conditioner after it, and I feel good and confident about my hair. Scalp is moisturised and not over-nourished, locks are smooth, straight and frizz-free. The scent is a fresh floral, not over-powering nice smell; it lingers for a while too. This shampoo is definitely a Hurray product! The bottle is simple and sleek, not too difficult to handle; I just wish they do a bigger 'family-size' bottle with a lower price-point - so I can keep repurchasing without guilt! Now that I have tried their Moisture and Repair line (read my initial review on that one), I am having an internal debate on which full size I shall buy next. I got two coupons to use so I can purchase 2 items. To know more about the brand and their lines, visit Sen's homepage to read more (external link). There can't be a more appropriate time for me to blog about Lush, why? 'Coz the UK company is re-opening new stores in Hong Kong (an end to the previous franchise biz mode). I have not yet visited their new store nor stand, so I can't tell if their pricing has changed or if the service has improved. I saw plenty of positive feedbacks from other "VIPs" who were invited to the opening party. Will pop into the store soon, I know I will! This Big Shampoo is not new to the blog-osphere. It is basically a truck-load of sea salt suspended in fresh citrus juice that gives volume. I use this on special occasion when I feel my hair is heavy and flat, or before a date or dinner with friends. The pretty fruity smell reminds me of the memory of another unknown shampoo which I used to use to remove chlorine from regular swimming in pools. Usually, I scoop about one to two table spoon with my fingers, apply it directly to the roots of my wet hair, and start massaging. Big Shampoo gives enormous foam. Gorgeous and fun to play with. When washed away, which is easy; hair is left squeaky clean and fresh-smelling, and Big. I have nothing bad to say about this, except maybe the tub-design. But hey, not only is this the signature minimal packaging of Lush, but also, isn't it the best when you are the boss of your salt, deciding how much saltiness and bigness you want to add to your tress? If you are curious about Lush's new development in HK, check out Lush Hong Kong's Facebook Page (external link)! The square pan on the left is a Canmake foundation which I used for very natural subtle contouring, it is just two shades darker than I am. Notice how the pan has increased in size? I am pretty sure I will empty it out in no time! The pink little guy, Canmake cream blush, on the other hand, didn't grow since I last pictured it. All I have done in these months was breaking its hinge, and a few rare applications - I should use it more often! Colour. BE-C is the Japanese naming of their foundation, BE means Beige, and it has more yellow tones than OC, Ochre, which usually has more pink. Different brands or even different formulae in the same brand name their shades differently. This matches my NC20-ish skin tone pretty well. Note: I'm not a MAC expert so I am not sure of my exact colouring now. Application and Finish. I usually use a dry sponge to dab and press this on, but have also recently fallen in love with pressing this on with a Real Techniques Buffing Brush. Either way, the finish is pretty flawless and holds all day. You can see me wearing this powder in a few past posts, which may give you a better idea of its finish. The Body Shop makes very good smelling products, in my opinion. There is an array of scents and products which can drive people who love fragrances, like me, crazy. I adore good smells but I do not particularly wear perfumes a lot, hence body products and room fragrances are the things I opt for. The Body Shop is pretty expensive, big mark-up %, here locally in Hong Kong. They do have occasionally promotions and member discounts, but I don't feel like tempted enough to shop there often. On the other hand, they have a factory outlet open in Tung Chung near the international airport, where a lot of stock are sold at great discounts. Last Christmas, I mean 2012, I was very attracted to the scent 'Ginger Sparkle', which is one of their Holiday Specials. 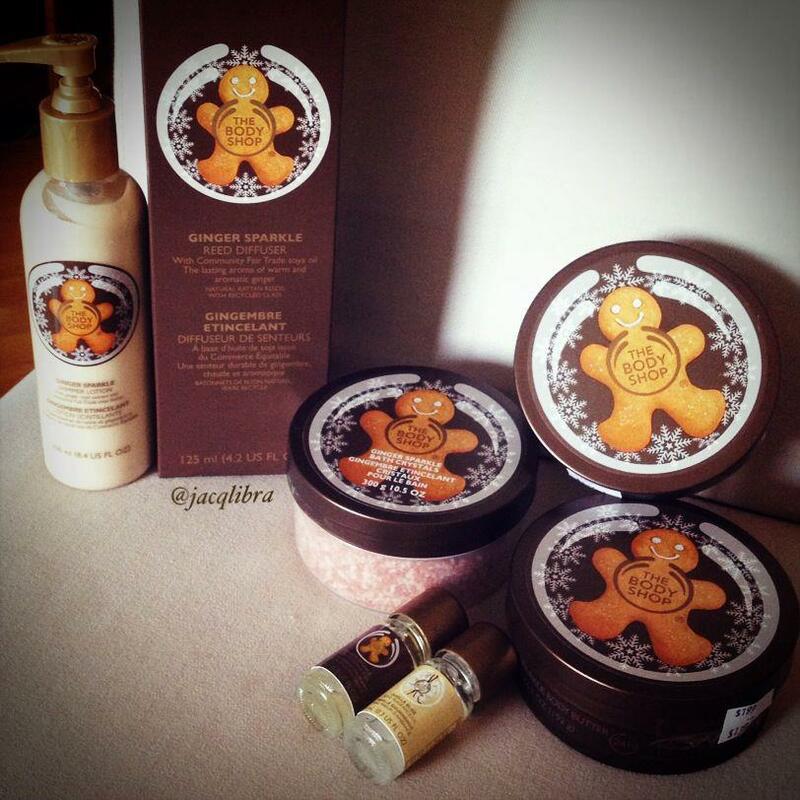 I call it the Gingerbread Man line because, obviously, the packaging design has gingerbread man printed all over! To my delight, I survived the urge to splurge in the real-stores, and waited long enough for the gingerbread man to travel all the way to factory outlet. They are all marked down with 30% discount, just a week or so after Christmas, which was around early January. I dragged Mister Fiancé there, and made him buy me a few of the long-wanted gingerbread man. The actual ginger sparkle scent is described as 'Zingy ginger'. To me I find it warm and fresh, with notes of ginger and spices as well as a pop of soda, like carbonated drinks! On the other hand, I picked up 6 older candles, probably from the year before, (i.e. 2011?). I have burnt 1 of them already, and find that with these, it tends to burn down the centre and doesn't melt the outer rim. To prevent wastage, I tried the warm water bath method to make the most out of the scent, i.e. put the candle - wax inside the glass jar - in a pot of hot water. The wax melts and aroma spreads, without burning. It will then cool down gradually and the wax can be reheated again and again until the aroma is all gone. iDivine Eyeshadow Palettes: I already own two before this order, the Original, and the Olympic special one. However, I have always wanted and lusting over the Storm palette. Pixiwoo uses that sometimes, and my friend Sam sings praises about it constantly (link to her blog). So I had to order it for myself. I also got another warm palette in Sunrise, which houses very beautiful reds and earth tones. 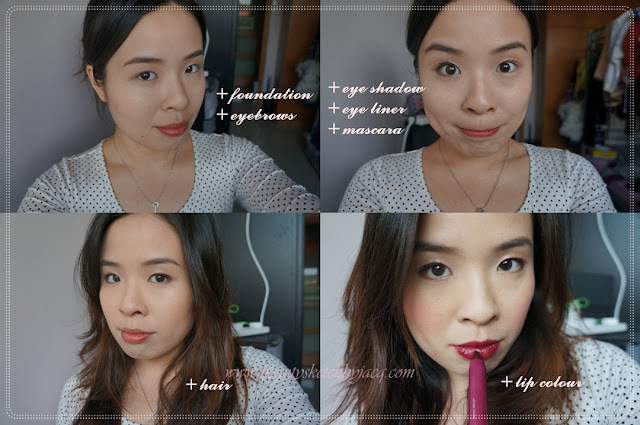 Swatches and comparison of the Face Form Medium, Contour Kit Light and Face Form Fair is below!